Experiments aboard the International Space Station with common pavement ants have shown just how badly microgravity impairs the insects' ability to search unexplored areas. Remarkably, however, tumbling ants demonstrated an uncanny ability to regain contact with the surface. There are over 20,000 species of ants on Earth, each perfectly suited to its environment. But there's one place ants haven't had the opportunity to evolve, and that's space. It might sound superfluous, but there's a good reason why scientists want to study ants in microgravity; it could lead to the development of sophisticated algorithms that drive fleets of autonomous robots in space. 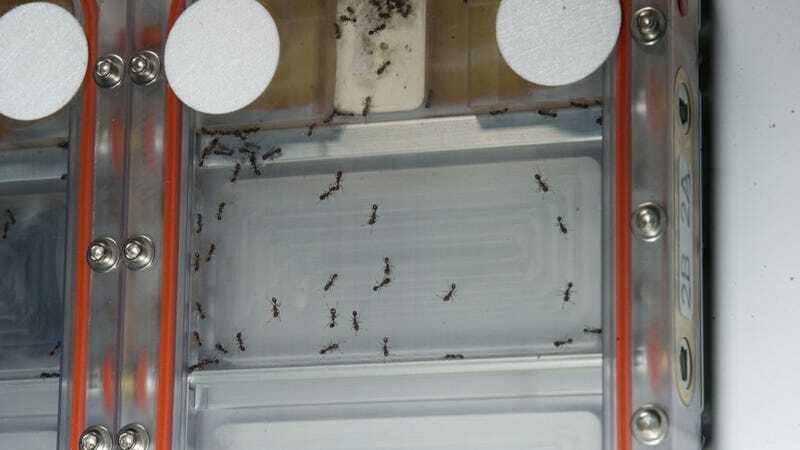 The ISS experiment, which was designed by Stanford's Deborah M. Gordon and carried out by ISS astronauts in January 2014, examined how common pavement ants were able to perform collective search without the benefit of gravity. The experiment itself was actually quite simple (an on-Earth demonstration by Dr. Gordon can be seen in the above video): Ants enclosed in a small area are exposed to a new space, followed by more exposure to an even larger space. The point was to observe how a fixed number of ants fared in their explorations as the territory increased in size and as their density across this space was diminished. Pavement ants tend to take semi-random paths when their density is high and the space is small, but when there's a large area, they tend to walk in more direct paths. When this experiment was conducted on Earth, virtually all parts of the container were explored by more than one ant within a span of five minutes. But as one might expect, a microgravity environment posed some serious issues for the ants. Try as they might, their ability to collectively search the area was seriously hampered by the lack of gravity. At any given time, some 7-10% of the ants were free-floating in space — sometimes for as long as three to eight seconds. When they finally regained their footing, they couldn't properly assess where they were and how far apart they were from their companions. The ants also moved very slowly to keep their footing. As a result, they were never able to spread out as effectively, and some parts of the enclosure were never visited. "Because ants in microgravity did not use straighter paths or traverse more distance when the area to be searched expanded, they did not search the area thoroughly," conclude the researchers in their ensuing study, which now appears at Frontiers in Ecology and Evolution. An ant that lost contact with the surface usually turned and tumbled in the air, or skidded rapidly, in the small space between the two surfaces of the arena. This indicates that the ant exerted some pressure on the surface before losing contact with it; otherwise the ant would have just floated away from the surface without turning in the air or going quickly in one direction. Sometimes an ant attached itself to another ant to climb back down to the surface. Once they regained contact with the surface, the ants held on by flattening their bodies towards the surface. In future, the researchers are hoping to conduct similar studies on different species of ants, writing that "we are likely to discover many new distributed algorithms for collective search, and to learn about how evolution has shaped collective behavior in response to local conditions." Read the entire study at Frontiers in Ecology and Evolution: "Collective Search by Ants in Microgravity".